Add this lot to your Wants List and we will notify you when another copy is being offered. To use the Wants List you will need to sign in or register. You can then use this Add to Wants List link to add a past lot to your Wants List or alternatively new wants can be created manually by clicking on My Account and then on Wants. For further help please do not hesitate to Contact us. Into the Eastern Province of the Cape of Good Hope 1834-1835. Have a similar item to sell? Contact Us with the details. 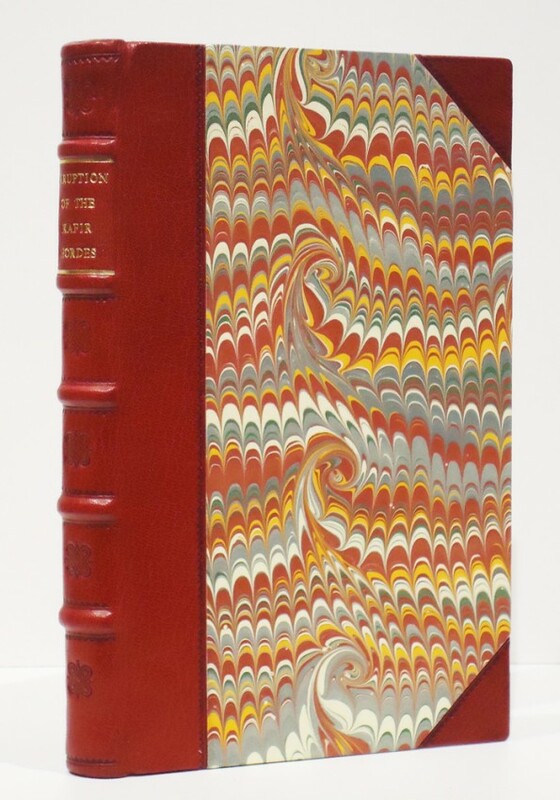 Compiled from Official Documents and Other Authentic Sources, by the Editor of the "Graham's Town Journal"
280 pages, map of District of Albany and adjacent country overrun by the Kaffirs, 1834-1835 as frontispiece, inscritpion on a front free end paper, rebound in half maroon leather with matching marbled boards, red title label gilt on the spine, some pages browned but overall a very good copy. 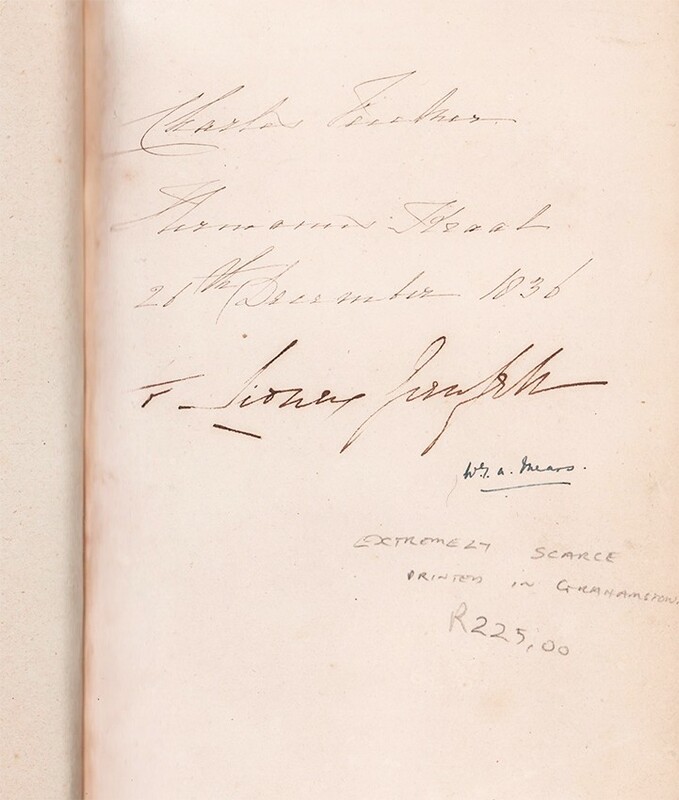 Mendelssohn (Sidney)South African Bibliography volume 1 page 611-612: An account of the Kaffir War of 1834-5, compiled from articles contributed to the columns of the Graham's Town Journal, official reports and despatches, the author's personal knowledge of the incidents of the campaign, and from information received by him from Sir Harry (then Colonel) Smith and his officers. It is stated that the volume serves "as a faithful record of the severe and trying difficulties which the early settlers of Albany and the inhabitants of the frontier districts in general, had to contend with in defence of " their hearths " against the inroads of "a barbarous, dishonest, and treacherous people." The hostilities appear to have had their rise in the murder, by the Kaffirs, of a trader named Purcell, and it was asserted that " the overbearing conduct and dishonest practices " of some of the traders contributed to the causes of the war. From the evidence contained in the volume, however, it is an indisputable fact that the lenient methods pursued by the authorities with regard to the thieving propensities of natives, gradually resulted in more daring outrages on their part, and robbery and murder became prevalent, together with encroachments upon the territories of the colony, encouraged by the knowledge of the weakness of the military garrisons, and as soon as reprisals were attempted by the colonists aided by the troops, war broke out in earnest. There is a full account of the various tragedies perpetuated by the Kaffirs on the settlers and traders, and it is interesting to note the existence of a class of residents in South Africa who apparently were quite ready to make excuses for the depredators, and whose views were advocated by the Commercial Advertiser of Cape Town. 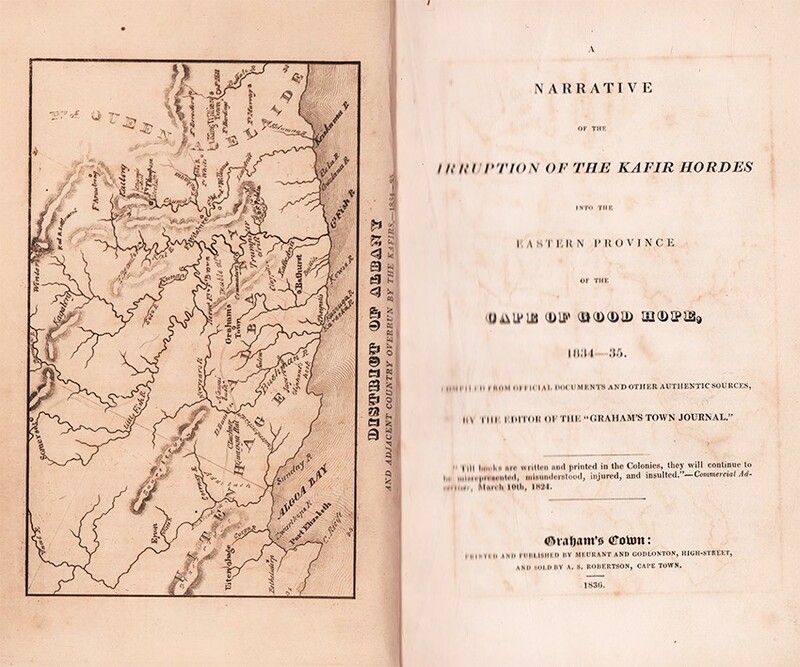 At the commencement of the hostilities the natives enumerated their grievances, and set forth their case in a " Statement of the Frontier Kaffirs to His Excellency the Governor," sending the document in by a missionary named J. Weir. This interesting manifesto on the part of the Kaffir chiefs is criticised by the author, and a great number of the statements flatly contradicted. The campaign was carried on with great vigour by the troops assisted by the colonists, and it is observed that " It is but justice ... to state that . . . the conduct of the Dutch-African colonists was beyond all praise." There is an account of the death of Hintza by Mr. G. Southey, who shot the chief when attempting to escape, the author alleging that Hintza " ought never to have been trusted." Peace was entered into with Kreli (Hintza's son and successor) on May 19th, and with the Gaika [tribe, represented by Makoma,.Tyali, Eno, and Kusia for Suta, and Sandilli and Fandini for Botma, on September 17th, and was signed by Sir B. D'Urban as Governor and Commander-in-Chief. In the Appendix will be found many important notices and general orders, a return of the estimated losses of the inhabitants on the eastern frontier during the irruption, a list of persons not belonging to the army, who lost their lives during the war, and a sketch map of the district of Albany.